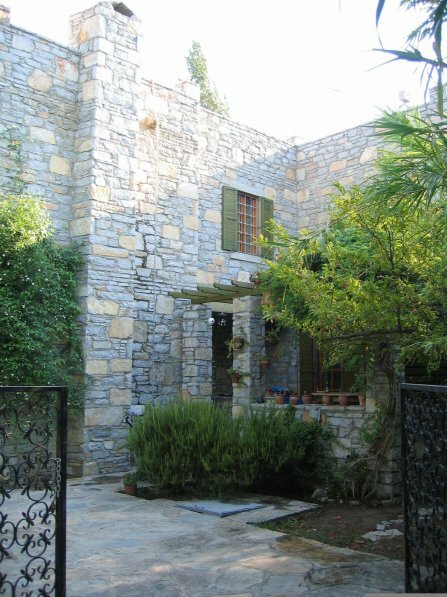 With four/five bedrooms the house suits a large family or groups of friends who want a quiet house only 5 mins from the beach. Built in 1998 by an international Turkish/Swedish architect, the newly renovated Stone House reflects modern design rooted in traditional Anatolian building style. Unlike most recently constructed houses in the area, it is not the typical concrete white-painted block, but a two-storey building on four levels made of solid local blue tinted limestone. The property sits in a small mandarin orchard with fig trees, oleanders, pomegranate and jasmine. It is a tranquil setting hidden away from the bustling seaside resort of Bitez only five minutes walk from the house. With four bedrooms the house suits a large family or groups of friends who after a day on the beach or visiting nearby Bodrum want a moment to relax sitting under the hibiscus-covered pergola away from the bustle of the sun-worshipers. Bitez was once a small fishing village that over time has become a popular tourist destination particularly for windsurfers. Along the long sandy beach are small hotels, pensions and a wide selection of restaurants, bars and cafes. The actual village of Bitez, is a two-minute drive from the house where there is a selection of shops and a weekly market. There is windsurfing in Bitez or on the quieter nearby bay at Aktur. For those wanting something more relaxed one can rent a typical Turkish gulet sailing yacht. These are handcrafted boats in mahogany and teak, and are more designed for comfortable cruises than speed. You can rent by the day and these spacious boats have ample cabin space and are equipped with toilets and showers, some even have conveniences such as air conditioning. You rent these yachts complete with experienced crews, including chefs serving the best of eastern Mediterranean cuisine, highlighted with fresh seafood.